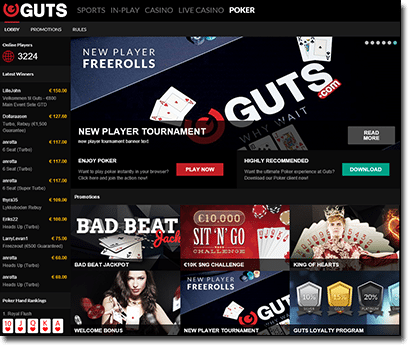 Guts.com has made a big impression in the online gambling world since 2013, earning rave reviews for the quality of its real money casino games and sports betting platforms. The newest string on that ever-growing bow is Guts Poker, which launched in early 2016 and is poised to become a major player on the Internet hold’em scene. Note: This review is intended for our international readers only. Guts Poker does not accept Australian players and Australians cannot gamble online as of September 2017 due to the Interactive Gambling Amendment Bill 2016 coming into full legal effect. You may know Microgaming as the world’s premier developer of online casino games for desktop and mobile play. But the British firm, based on the Isle of Man, has also made big strides in real money poker in recent times. Established in 2003, the Microgaming Poker Network (MPN) is not only one of the oldest gaming operations of its kind; it is also one of the few which continues to grow year on year. The brand has expanded well beyond its traditional stronghold in Europe since 2014, when the MPN Poker Tour was launched, and now supplies and software platforms for nearly 30 different online poker rooms worldwide. Among those proud members of the MPN is Guts.com. That means you can expect only the very best in terms of quality, performance and fairness at Guts Poker, as all games are developed by Microgaming – the most trusted name in online gambling. 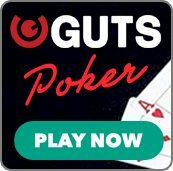 Sign up at Guts.com and create a poker alias to activate a $1000 cash bonus. This is paid in $5 instalments for every $25 you contribute towards the rake by playing real money poker games. You have 60 days to complete the bonus, at the end of which it is credited to your account as real cash – and that means no further wagering requirements. If you’re not quite ready to risk your own hard-earned dollars at the tables, you can ease your way into things by taking part in one of Guts Poker’s freeroll tournaments for new members. Multi-table events such as the $1000 New Player Freeroll and the $500 New Player Turbo allow you to play for real without having to risk any of your own cash. Every time you play a real money poker tournament or ring game at Guts.com, you earn Guts Points which can be exchanged for straight-up cash. The more points you earn each month, the higher your loyalty status will be – and the higher your loyalty status, the more money you can get back for your Guts Points. There are two prominent links located in the centre of the Guts Poker homepage. One says ‘Play Now’ and the other says ‘Download’. These correspond to the two desktop gameplay platforms from which you can choose. The question is: which one is best for you? Fast and fully loaded, the Guts Poker instant play lobby is a great option for those who don’t always use the same computer. Hit ‘Play Now’ to load up the whole range of cash games, tourneys and more, straight through your Internet browser. If you want a more permanent base of operations (and a few of those extra features which aren’t available via instant play), the complete Guts Poker software suite is the way to go. Select ‘Download’ to start the free installation process. Variety is the key to a great poker site. Whether you are into cash games, multi-table tournaments, or sit-and-go events, Guts has you covered with countless online hold’em and Omaha poker tables running all day, every day. Fixed limit, pot limit and no limit betting are all available across a variety of traditional and ultra-modern gameplay formats. These are your traditional poker tables where you can buy in and cash out at any time. A wide range of stakes are offered to suit beginners and seasoned veterans alike, starting at $0.01/$0.02 micro stakes and going up to $50/$100. SNG poker tournaments have enjoyed a huge boom since the turn of the millennium, partly because they are ideal for online play. Rather than waiting for scheduled starting times to roll around, the action begins as soon as all the spots are filled. The Guts Poker tournament lobby features four key categories: guaranteed, satellites, freerolls and special. All the formats are covered, from turbo and super turbo to deep stack and big ante to rebuy and freezeout to six-max and early bird. Late registration is allowed on most events with guaranteed prize pools, which can offer anywhere from $50 to $25,000 and up. Microgaming’s special fast-fold poker tables are designed especially for players who like high-speed games and hate waiting around. As soon as you fold out or finish a hand, you are immediately dealt in at a brand new table. That means you are always in the action, so there is no staring into space and twiddling your thumbs while you wait for your opponents to play out a pot. If you want to play at an even faster rate, you can enter yourself in the same pool multiple times. Blaze Poker players can also enjoy the Blazing Cannons bonus game, which is unlocked after you win 20 raked pots. In recent years online poker has become rife with sharks preying on new players. Guts.com’s Anonymous Tables look to combat this by concealing each player’s details from one another. Only you can view your avatar and alias in an AT game, while tracking software and bots are prohibited altogether. This novel concept provides newbies and recreational punters with a safe, secure environment in which to learn and have fun, without having to worry about being sharked and scammed. Online poker players can choose from a number of secure transaction options at Guts. You can make instant deposits up to $5000 at a time with leading credit/debit cards (Visa, MasterCard) and e-wallets (Neteller, Skrill), while prepaid money vouchers (Paysafecard) come with a $200 maximum. Withdrawals via bank transfer are quick and painless too, with an expected completion time of 24 to 48 hours. As with the Guts.com sportsbook and online casino sites, every bit of information you provide – be it your home address, your phone number, or your credit card details – is protected by a certified SSL (Secure Socket Layer) digital encryption. This is the world standard in online security and anti-fraud protocols, so you can rest assured that your money and personal info are in safe hands. The Guts customer support setup is one of the best in the business. Tap the ‘Help’ tab at the bottom of the home page for useful information on deposits, payments, security and rules, as well as an extensive library of FAQs. If you need to talk to someone on the Guts Poker team directly you can open the live chat window, call on Skype (guts.poker), or send an email ([email protected]). Sign up for real money poker at www.Guts.com today and score up to $1000 bonus cash.